Our 300 hour Yoga Teacher Training Course in Rishikesh, India will build upon the foundation of your 200 hour TTC program. Our course creates a space for 200 hour Registered Yoga Teachers to further their philosophical understanding of yoga both as a practitioner and an instructor. During enrollment participants will develop a daily practice of Yogic Kriyas, Asanas, Pranayamas, Bandhas, Mudras, and Dhyana. In addition to learning advanced teaching methodology, students can expect to deepen their knowledge of Yoga Anatomy and Structural Yoga Therapy. Upon completion of Shakti Yogapeeth's 300 hour Yoga Teacher Training graduates are eligible to register with Yoga Alliance USA as a RYT-500. Our goal is to provide you with a holistic experience and our staff is dedicated to fulfilling that aim. From your lectures and practical classes, to dining services and travel arrangements, we are committed to providing you the support you need along your journey. Advanced Hatha Yoga postures with Alignment, Adjustment and modification. 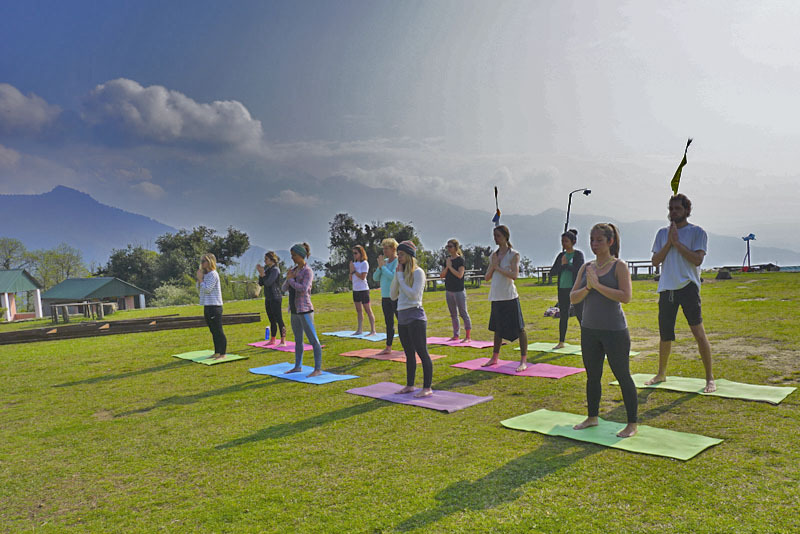 Full Curriculum of 300 Hour Yoga Teacher Training in Rishikesh. We are located in Rishikesh, a town which is nestled at the foothills of serene Himalayan ranges, and at the bank of the mighty river Ganga. From your room window you would be getting the amazing view of the natural splendor and chirping of beautiful birds. Besides, the market is just 2 mins walking distance away from our school where you can buy all the necessary items. We offer you clean, beautiful, and airy rooms. Rooms we provide here are either independently or on the sharing basis. Our Yoga hall speaks of its authentic look, and appeal. It is quite spacious, clean and beautiful and complete with all the basic facilities. Besides it, we have installed CCTV cameras in the complex to ensure security and discipline in the School. Enjoy the local site and knowing and understanding Himalayan culture. It would be an opportunity for you to experience, learn and understand the surroundings and about the local culture. Wednesday will be your day for spiritual excursions and adventure through the traditional routes where the great yogis and yoga masters had lived and practiced. You would move on the tracks of the Himalayas towards the caves. Since thousands of years pilgrimage has remained an imperative part of yoga sadhana, providing yogis and devout seekers to experience the positive energy that emancipates from the shrines of the Himalayan temples. It would be an unforgettable experience as you would challenge your spirit as you trek on the narrow paths of the Himalayas. Students would also be enjoying rafting over the river Ganga. It is an not to miss opportunity as you negotiate against the swift river currents and float through terraced hillsides. You can either take a direct flight to Dehradun which is duly connected to the international airways, or you can reach Delhi International airport. Delhi is 242 km from Rishikesh. You can hire a taxi from Delhi International airport or we can also send you a taxi at the airport to receive you. But you have to book the taxi from us in advance, the charges of the taxi is 80 dollars. You can either hire a taxi from Delhi International airport or we can also send a taxi/cab to receive you at the airport. Or we can also send you a cab at the Jolly International Airport at Dehradun.Cost of the Cab from Delhi International airport: 80US dollars For Jolly International Airport: 20 US dollars. You can also reach Rishikesh via Volvo or any luxurious coach from Interstate Bus Terminus at Delhi. We can either send you a taxi to receive at the bus terminus in Rishikesh or you can hire an auto rickshaw to reach Lakshman Jula. Cross the bridge by foot as vehicles are not allowed. School is at a short distance from the bridge. You can also journey by train from Delhi to Haridwar, a religious place which is 25 km from Rishikesh. Haridwar has good railway network connecting many cities of India. You can also request for a taxi from us for Haridwar station or you can hire your own taxi. The taxi charges: 20 dollars. Smoking, drinking, eating the non-vegetarian diet in the premises is strictly prohibited. Use of Cell phone is strictly prohibited. Appearing in both the theoretical as well as practical examination is compulsory. Participation in Karma yoga is compulsory. Students should inform the concerned person well in advance if you intend to skip any meal/s. Teachers must be informed in advance in case you are absent from class or meals due to illness, injury or any other personal issue. For the video recording or photography of any session, it is mandatory to take permission from your teacher. Students should follow all the rules and maintain discipline in the School. Any student found breaking the rules or caught misbehaving in the premises could be disqualified or severely penalized.